iP3: How long from iPhone announcement to launch? Fortune does a nice look back on how long Apple has waited from announcement (which seems to be October 4th at this point) and actual launch of the iPhones and iPads. 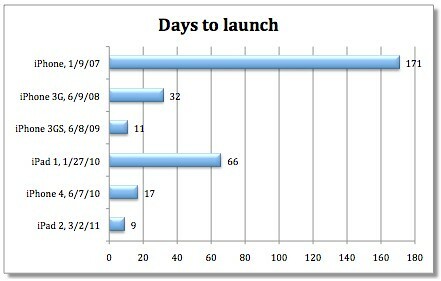 Initial launch windows are huge because there weren’t really competitors in the space quite yet. Importantly, the general trend is towards a smaller window. Ten days out, October 14th, seems like a reasonable projection, doesn’t it?